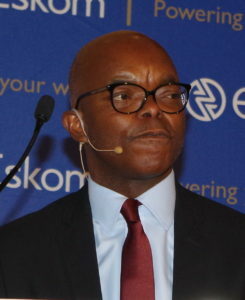 Eskom’s new chief executive officer, Phakamani Hadebe, says the board has approved a turnaround strategy which will address the power utility’s major difficulties. The institution has compiled a 9-point recovery plan which is designed to overcome problems in its generation division and enable the power utility to meet its obligations to provide a reliable supply of electricity to South Africa’s industries and residents, as per its mandate. 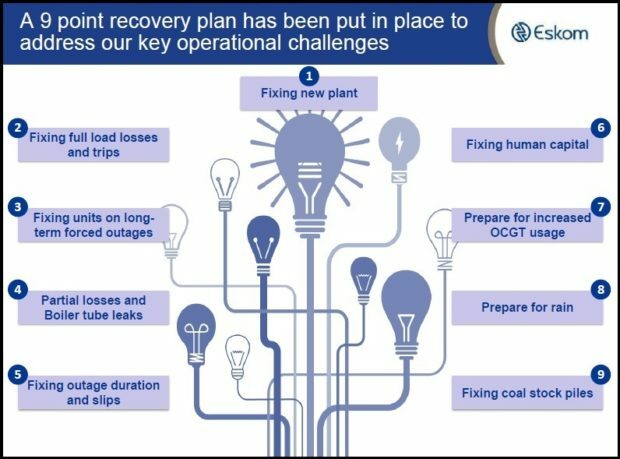 Speaking at Eskom’s “State of the System” media briefing at Megawatt Park recently, Hadebe acknowledged that the institution’s generation division is facing serious challenges, with many of its coal-fired power stations under-performing. Hadebe reported that ten power stations had less than 20 days-worth of stockpiled coal as required by the South African Grid Code. He said that this situation had materialised as a result of the power utility refusing to accept deliveries of poor quality coal from certain mines, as well as the recent strikes which had interrupted the supply of coal to the power stations. This, together with unplanned outages at some power stations for essential maintenance and repair, resulted in the organisation having to use its open cycle gas turbine-driven peaking plant more frequently and for longer periods of time. 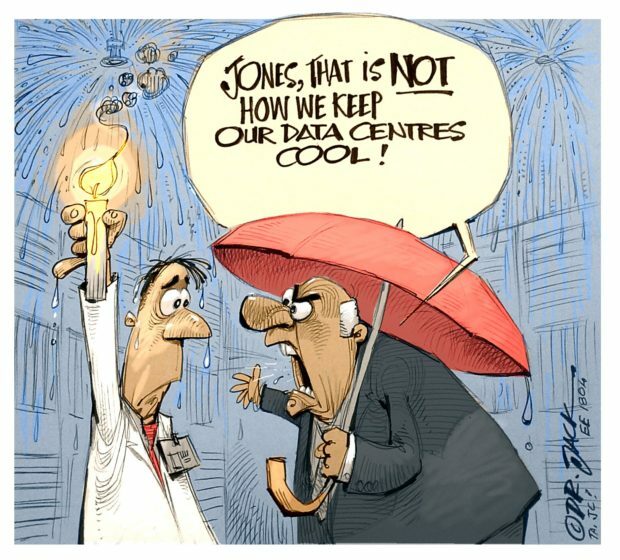 In the meantime, however, the risk of rotational load shedding is very high, he warned. Two days later, Stage 1 load shedding was implemented. Power was interrupted, on a rotational basis, for about ten hours. Stage 1 removes 1 GW of load from the network. Design flaws and problems during construction have caused extensive delays at Eskom’s new-build power stations – especially Kusile. Hadebe said a dedicated “SWAT” team would be deployed to Kusile to ensure that the correct skills are on site to address problems as they occur in order to prevent further delays in the completion of this project. One wonders what that will cost. The utility intends to optimise procurement processes to enable swifter purchases when required; improve the planning, execution and effectiveness of maintenance, and improve the use of local purchase orders at site level. Apparently spares management needs an overhaul and Hedebe said that the optimisation of spares would reduce waiting time on site. The objective is a complete project to improve maintenance strategies and work packages. A number of units at various power stations are undergoing repairs. Lethabo suffered a high pressure steam pipe failure which will take a year to repair; Duvha’s Unit 4 turbine tripped resulting from an earthing fault but is apparently back in operation and there was a steam pipe leak at Grootvlei’s Unit 2. That is apparently due to be back in operation before month-end. The stator in Kriel’s Unit 2 needs to be replaced which will probably to keep it out of operation until the end of April 2019. To address partial losses and maintain critical plant systems at its coal fleet, the power utility is planning for 59 of its generating units to be offline between September 2018 and December 2019. This could cost up to R11,5-billion, Hadebe said. Hadebe said that three power stations – Arnot, Kendal and Duvha – contribute about 50% to total partial load losses, and that a large percentage of the power utility’s partial load losses come from its draught plant. The draught is one of the most essential systems of thermal power plant which supplies the required quantity of air for combustion and removes the burnt products from the system. Hedebe said that the utility will appoint permanent managers and their critical subordinates at all its power stations. He said that currently, over half of the power stations have acting managers, and some power station managers are under investigation. Hadebe said the power utility plans to “relink and relocate” some commercial and human resources personnel to its generation division to keep accountability at generation group level. The institution is also short of certain essential skills and has initiated a recruitment plan to effect appointments by 1 February 2019. Bloomberg reports that it has seen an internal memo which indicates that Eskom is proposing executive job cuts and a reorganisation of management in an effort to improve the utility’s financial position. The utility proposes a new leadership structure and plans to reduce the number of the most senior executives, a level known as F-Band employees, based on international benchmarks and comparisons to similar electricity companies reviewed by Boston Consulting and a Lazard report, according to the document. Eskom’s own strategy work along with consultancy findings were considered “as a basis for recognising that a restructure at executive level is warranted,” according to the memo Bloomberg saw. The utility will work to minimise the risk of load shedding or reduce the degree or duration of load shedding. A sum of R750-million to R1-billion for fuel for the utility’s open cycle gas turbines (OCGTs) has been forecast to the end of March 2019. However, this excludes OCGT usage to mitigate for risk of rain, Hadebe said. As the country heads for the rainy season, Eskom must ensure that its power stations have access to dry coal at all times. Hadebe said the utility has devised a strategy to keep at least three days of coal aside from the bulk stockpiles as strategic stockpiles for use during sustained rainfall at all critical power stations. Procedures have apparently been put in place for power station managers so that they know how and when to use these strategic stockpiles. The current problem of too-few day’s coal at a power station can only be addressed by increasing the coal stockpile at each power station. However, this will take time, and although the utility has prioritised it, coal stockpiles will increase slowly, Hadebe said. These stockpiles are projected to grow to 28,2 days by 31 March 2019 from existing and new signed contracts, ending with six stations still below the Grid Code requirement. It is projected that all stations will reach the expected level between September 2019 and February 2020, he said. The announcement of this 9-point plan certainly offers some assurance that the new board which was put in place by President Ramaphosa a few months ago is taking the situation seriously. 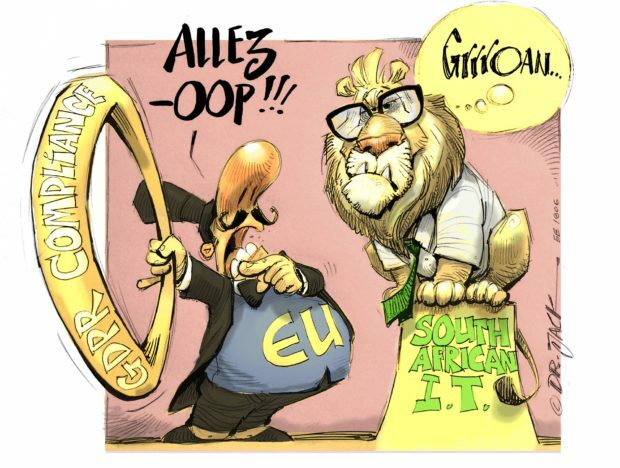 However, one must question why the situation was allowed to become so severe and how the management of arguably South Africa’s most important asset was able to allow things to get so seriously wrong. Surely the fundamental question must be: who will be held accountable, when and what punishment will be imposed?